This is the lower part of the Ocklawaha River and is as it was hundreds of years ago, in its pristine natural beauty, totally unmarred by restaurants, marinas, gas pumps or waterfront homes. The natural landscapes are mostly hydric hammocks and flatwoods, with scrub pine ridges and sugar sand banks. The trail starts at the Kirkpatrick Dam managed by the DEP/OGT and ends at the St. Johns River across from Welaka. This was the main tourism attraction in Florida for over 50 years during the 19th century. 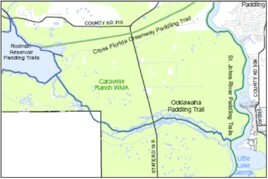 The Ocala National Forest on the southern banks and the Caravelle Ranch Wildlife Management Area (SJRWMD) on the northern banks border the shores. This is the largest of the St. Johns River’s tributaries. Parallel to the river is Bear Creek, which offers tight wilderness paddling on the way from the Highway 19 bridge to the river. The OGT manages the adjoining Cross Florida Greenway hub and Rodman Campground. Welaka is 0.3 mile from the mouth of the river. There are two landings in the Kirkpatrick Dam area – one paved boat ramp on the eastern side of the dam and a sandy landing on the western side. Restrooms and picnic areas are available here. There is a public landing at the Highway 19 bridge known as the Johnson Field boat ramp. The Ocala National Forrest manages a campground at the historic Davenport landing. Welaka’s public ramp is 1 mile from the mouth. This is the most beautiful of Putnam County’s Paddling Trails. The river flows steadily and there is turn after turn to keep paddlers alert. The trail is the most paddled waterway in the county. The Ocklawaha is teaming with wildlife including alligators, snakes, and hornets. There are several sandy beach landings along the river including the historic Davenport Landing. The Ocala National Forest manages a campground here. About half way down is the Highway 19 bridge and Johnson Field boat ramp. The mouth of the river is 1 mile from the Welaka public landing and boat ramp. There are restaurants and facilities within walking distance. 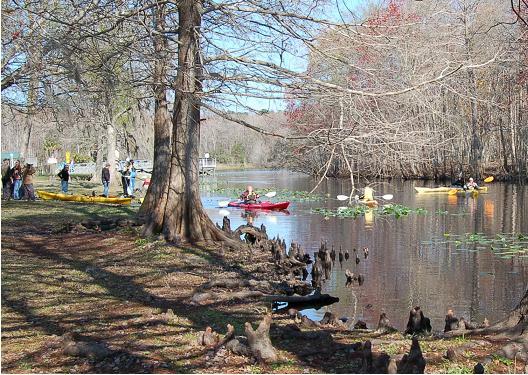 When paddling the Ocklawaha River, it is recommended that paddlers keep to the beautiful shorelines. There are marked channels on the river and caution should be used when crossing the channels, especially crossing the St. Johns River. GPS coordinates will be available on the county’s website and in brochures.